There's little that Laura Rosenshine, founder of Common Ground Compost, doesn't know about compost. In fact, having met her years ago, worked with her on a couple of occasions and even learned how "to bokashi" at one of her workshops (we've decided to turn "bokashi" into a verb), there's not many other folks who I can say are also as ardent about the subject as Laura, which is all the more reason to do an interview with her on the topic. Summer Rayne Oakes: I have to ask: what’s one of your fondest memories composting? Laura Rosenshine: I had been volunteering at the Children's Garden/El Sol compost program on 12th street in the East village and we were getting ready to trench about 150 lbs of fermented Bokashi food waste and while we were digging out the trench we came across a worm ball, that’s right, I said it, a worm ball, and it’s exactly what it sounds like a ball of worms! The Children's Garden has been trenching for a number of years so the soil is really healthy and worms are common as they are a primary decomposer that help turn the fermented food waste into soil. I made a short video the day I witnessed this which you can see here: Bokashi Worm Ball. 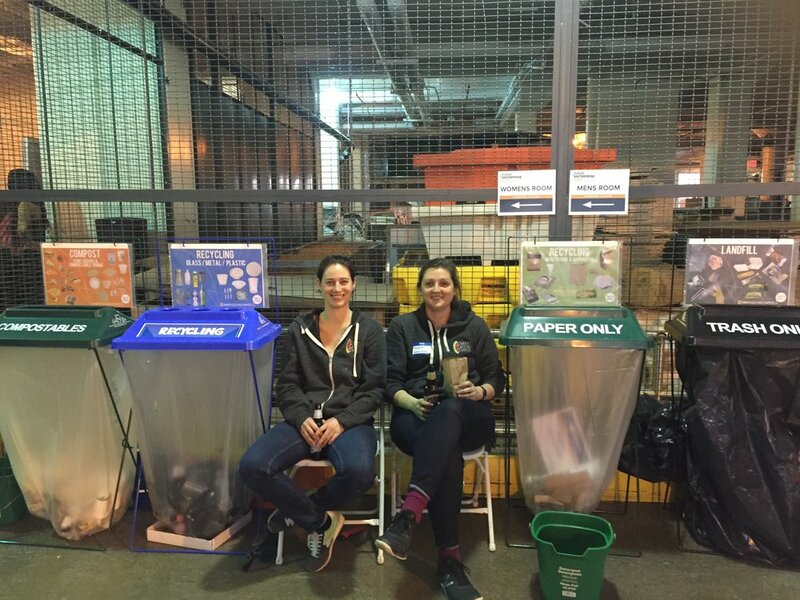 Laura Rosenshine (left) is passionate about composting and recycling (if you can't tell). Photo courtesy of Laura Rosenshine. SRO: I love the surprise of seeing so many worms in my compost! Did you think this was going to be your profession? LR: Never in my wildest dreams! I started to become interested in sustainability my last 2 years of college when I really started noticing the winter weather be really inconsistent, 20°F one day, 50°F the next it was strange. But this was in 2004 when colleges didn't really have sustainability as a department or major. Also to be honest I still had no idea what I wanted to be when I grew up at that time either so I was just taking courses that I thought made the most sense and were interesting, I remember one called “environmental philosophy” which I really enjoyed. Fast forward 3.5 years, working in NYC in the production department at a large ad agency I hit my max when working super late one night on a Nivea project. I had thought it many times before, but this time it was different, “Why am I spending my time working on a brand that I would NEVER buy?” Shortly thereafter I quit. And following that I was lucky enough to take a 3-month trip to New Zealand to volunteer for a sustainable living program. There I learned about composting. Though it was not a huge focus point of the program, we never put food scraps in the garbage. When I came to NYC, I started to investigate how to compost in the dense urban environment that is NY, connecting with the Lower East Side Ecology Center, which has been a leader in the composting space for a number of years— 20+ I believe. Things spiraled in amazing directions from there and I have not looked back since. LR: Common Ground Compost (CGC) is mostly a consulting company; we help restaurants and businesses of all sizes set up compost programs. From waste audits, to hauler contract negotiations, to education, training, custom signage, product procurement, infrastructure, we learn what the goals are of the business and help them meet them. While composting is our focus, we always get involved in normal recycling as well! SRO: But your website is so informative as well. LR: Yes, we make sure our website helps provide people from other areas with some info on how they can participate, including residential, school and community composting. Anyone that contacts us we will help them directly or direct them to other programs that will. We also have two side projects within CGC. LR: Well, one is our events program. We will set up and manage recycling stations at private events. We love this work because it is a great opportunity to educate and we believe that the more people see proper waste stations the more they will understand the importance of source separation. There are a lot of organization that want this service in NY because it is part of their mission, we love supporting them. We also run a small compost collection program that we call Reclaimed Organics. We have a partnership with a local public school that allows us some storage space for our bike and trailer, 3 days a week one of the haulers cruises around the East Village and parts of the Lower East Side and West Village to collect compost from small businesses and residents. The Huffington Post was kind enough to highlight our program last summer in this video. We process a majority of the organics still at the garden, using the bokashi method, but as we grow we will be partnering with a local hauler and hopefully more gardens. Some of the compost scraps collected near community gardens and farmers markets. Photo courtesy of Laura Rosenshine. SRO: I love all that you're doing, but let's get to the important part—why you do it! LR: I do this work for a number of reasons, which I'll outline. Food and food scraps can be recycled, not that many people know that. Restaurants that prep food can have up to 50% of their waste be food scraps, separating that for recycling can be a huge step towards reducing what goes to landfill. It's hard for people to see a metal can get recycled, but in the garden, you can see food scraps turn to soil in a matter of weeks! It is a great educational tool and helps us keep resources local. Recycling food scraps is a great way to close the loop, a common term heard in sustainability, grow food, prep food, eat food, recycle scraps, make compost, grow more food. SRO: You had recently collaborated on The New York Compost Box Project. Share a little more about that. LR: The NY Compost Box Project is a combined compost, art and guerrilla tactic project. Debbie Ullman, a NY Master Composter and artist, found a number of unused NY Post boxes—the kind you see on the street. She made them into NY COMPOST boxes so people could drop off their compost. One criticism of the current system for composting in NY is the lack of convenience, this helps solve that by allowing people to drop off 24/7. We have a box locked to the outside of our garden, the box is locked shut so only people that have the combination can access it. We ask that they watch our drop off video so they know how to properly drop off and then we give them the combination. The team from Reclaimed Organics empties the box 3 days a week. SRO: Such a brilliant idea to bring more awareness to the city (and another place to drop off compost)! When I was out petitioning to get curbside pick-up in my area, I spoke with folks who had recently moved to New York City from places like Seattle, Portland and San Francisco. Most were shocked that NYC was behind on composting. Where is NYC now in their efforts to reduce food and yard waste? LR: We are going in the right direction that is 100% for sure. The Department of Sanitation is funding a lot of programs to make composting easier. By 2018 they are committed to having compost drop off sites in all NYC districts, I think there are 63. GrowNYC offers 40+ compost drop off sites at Greenmarkets around the city. The NY Compost project manages a number of additional sites called commuter drop offs that are open in the AM hours and are conveniently located near subway entrances. The NY curbside program is now the largest in the nation and maybe the world, it is going to continue to expand every year. Any building in Manhattan (I think over 10 units) can opt into their curbside program as long as the building owner is on board you can sign up here. Also there are over 200 community gardens that have compost programs, not all of them allow non members to drop off but a lot to, these are great options as well, and secretly my favorite! SRO: How much waste can a typical New Yorker divert from the landfill or incinerator if she / he composted in the home? LR: Gosh that is a great question. Relatively recent studies of residential waste show that close to 30% of household waste can be composted. Personally I rarely take out my trash, once every 3-4 weeks maybe. I probably generate the most in the glass/metal/plastic category because my sister and I have three cats (cat food cans) she drinks Red Bull, and I drink wine. After that we generate food scraps followed by a good amount of cardboard from online ordering and then mixed paper, trash is the least and the lightest because it is usually just plastic packaging that can not be recycled. SRO: I'm with you on the infrequent waste. You can divert so much when you compost! Speaking of which, when I spoke with the Department of Sanitation last year about getting curbside composting on the fast track in Williamsburg, they shared that high rises pose a unique challenge, largely because even if there were composting in the building, there’d be so much for management to haul off in the city’s current haulers; and most of the developers never think about composting / compost disposal in the beginning when actually building the building, so they’d have to figure out how to deal with it and build it into the building after it’s built. These are challenges I had never considered before speaking with the DOS, so I guess my question is how does composting fit into the context of a vertically-oriented city? Do we have to institute a law in high-rises about building out compost-disposal before buildings are built? What do we do with pre-existing buildings? Retrofit them? LR: Great question. I hear the issue you pose, but the truth of the matter is that we are not generating more waste, we are just creating a new category to sort it into. I am a believer that if you want something enough you will find a way to make it work. That being said I think we likely have to utilize some infrastructure that is not the most convenient to facilitate composting. Such as basement space or curbside space to collect organics. Moving forward there is an up side because there is currently a group of industry experts that are working on creating new design guidelines for recycling and compost, because you are right—waste and recycling are not properly considered in current building designs. This group is called AIANY COTE Zero Waste Design Guidelines from the American Institute of Architects New York Committee On The Environment. This work will dramatically help to make sure compost (and recycling) infrastructure is considered before buildings are built. SRO: That's promising. What do you think New York could actually save—money-wise and landfill space-wise—if we all composted and had the infrastructure for state-of-the-art composting? LR: Currently NYC spends more than $300 million from tax dollars to collect and dispose of the waste we generate, often sending it to surrounding states—sometimes as far as the Carolinas. Compost growth is a chicken and egg story; we have to guarantee that source separated organics/compost is being collected so that private investors will build more local infrastructure to process it. I don’t think New Yorkers would see their taxes go down per se, but the money could be used for better things instead of truck costs and disposal costs. Also these compost sites will be making a sellable product that will support sustainable farming and much more, not just burning trash or filling a massive hole in the ground. Plus composting has been proven to create many more jobs than landfilling so there are many upsides! Brown bins will be popping up everywhere throughout NYC by 2018. This is the start of the curbside organics pick-up to help divert food and yard waste from landfills. Photo courtesy of Laura Rosenshine. SRO: There has been a ton of attention around food waste over the last number of years, but particularly these past two years. What are the forces that you think brought about this change? LR: Landfills are on the decline over the last century, making them fewer and fewer and more centralized, which generally means we have to travel further. Also new regulations make it much harder to open new sites plus the NIMBY (not in my backyard) issues, that no one wants one in their town, which makes sense. But the other side is that there has been a lot of research done on food waste and the numbers are staggering—40% of the food we grow in the US ends up being wasted! It is crazy, so I think composting is getting a bit more attention because it is part of the solution, but the truth is we have to tackle the inefficiencies that lead to 40% waste first and then compost the real inedible things. SRO: I've kept you long enough, but I have one more question: What’s your 2020 compost vision?